(March 5, 2015) -- UTSA Roadrunners were out in full force at the annual San Antonio Basura Bash service event last week. Nearly 100 UTSA community members contributed more than 300 service hours. The students volunteered with local community service organizations along the Leon Creek waterway south of campus. UTSA participants included several students from environmental science classes, the College of Education and Human Development and the UTSA Campus Recreation Center’s Outdoor Pursuits Program as well as student organizations such as the Green Society and Volunteer Organization Involving Community Education and Service (VOICES). 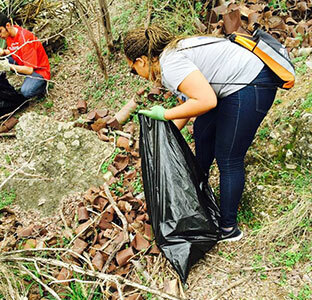 The UTSA participants joined more than 2,000 citywide volunteers in a regional effort to clean the San Antonio Watershed. Volunteers scoured the tributaries of the San Antonio River to gather trash and other discarded materials. "The importance of Basura Bash exists on multiple levels,” said Karen Engates, senior lecturer in the UTSA Environmental Science Program. “Getting individuals outside, in the local community, and picking up trash is just the beginning. It was a great form of exercise, and it enabled us to connect with each other as a team in a way that is not normally possible in the classroom. Most importantly, this event was a realization of how much we need to increase our commitment to the environment to protect our water resources, now and for the future." Since Basura Bash began in 1995, more than 428 tons of trash and 44 tons of recyclables have been collected by thousands of volunteers. For more information, visit the UTSA Center for Civic Engagement website. To view photos from the event, visit the Center for Civic Engagement’s Facebook page.